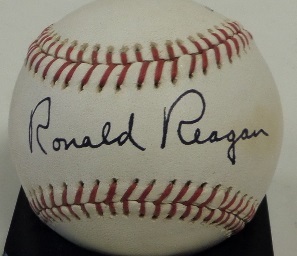 Coach's Corner - Ronald Reagan single signed vintage Wilson Baseball! Go Back to Lot List Ronald Reagan single signed vintage Wilson Baseball! This older Ponly League Baseball from Wilson is in EX/EX+ condition overall. It is hand-signed in black across the sweet spot by 40th US President Ronald Reagan, and grades a strong legible 9 overall. Retail is low thousands from the deceased Commander In Chief!